The Motorola DS3508 Series of rugged, corded digital scanners bring comprehensive, high performance data capture to harsh industrial environments to improve business efficiency. Engineered with breakthrough digital imaging technology, this scanner family delivers extremely fast and accurate data capture of one-dimensional (1D) and two-dimensional (2D) bar codes, images and direct part marks (DPM) as well as Item Unique Identification (IUID)* support. Available in three models, the DS3508 Series of scanners can meet a wide variety of data capture needs in multiple industries. With the DS3508 Series, you benefit from a scanning solution designed specifically for fastpaced production environments. The CMOS image sensors allow the accurate capture and processing of bar codes at a faster pace than the typical digital scanner. The DS3508 Series is armed with a powerful 624 MHz microprocessor, capable of decoding 1D or 2D bar codes within milliseconds, regardless of size or density. The patent pending fast-pulse illumination and fast sensor shutter speed enable image capture at a full 60 frames per second, delivering outstanding motion tolerance. In addition, the omni-directional scanning functionality allows operators to quickly capture bar codes from any angle, eliminating the need to align bar codes with laser lines. 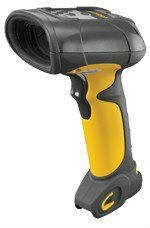 Plus, the DS3508 Series offers the widest working range of any scanner in its class. makes it impervious to dust and water, and the exit window is scratch-resistant and recessed for the highest level of durability. As a result, enterprises enjoy a low total cost of ownership — employee and device downtime as well as equipment repair and replacement costs are minimized.